Because education is an important part of the Mississippi Metropolitan Ballet’s mission, we continue to hold complimentary performances and conduct student workshops and lecture demonstrations for at risk youth and children who live in areas underserved by the arts. Each year MMB has a commitment to provide meaningful educational experiences that contribute to the cultural development of Jackson-area school children, traditionally those underserved. 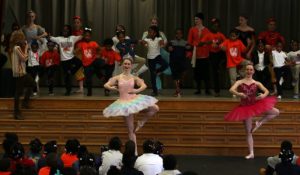 Through a unique and ever-expanding outreach program and the continued support from the Mississippi Arts Commission, the Mississippi Metropolitan Ballet has introduced the art of ballet to over 15,000 children since the beginning of this program in 2000. Children have attended from Sunnybrook Children’s Home, the Boys and Girls Clubs of Mississippi, Magnolia Speech School, and the Bethlehem Center. We are also planning a new program that will award scholarships to low income students who possess a desire and natural talent for dance. 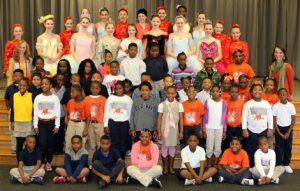 Elementary, Middle School and High School age children are invited to attend a full dress rehearsal of The Nutcracker performed by the Mississippi Metropolitan Ballet Company. Children from Sunnybrook Children’s Home, The Boys and Girls Club of Mississippi, Magnolia Speech School, and the Bethlehem Center have attended in the past. Each year a different metro-area school is selected to participate in an educational workshop given at their school prior to the company coming to give a live performance for the school. Select students are also given the chance to participate in the performance. Schools that have been chosen in the past include: Velma Jackson, Camden Elementary, Luther Branson Elementary, and Ann Smith Elementary.